Meet the ridiculously fast way to write term life insurance. Quote, compare, and submit an order in just 5 minutes. Get underwriting decisions in days instead of weeks with our AU* breakthrough. Groundbreaking technology = No exam, no blood, no medical records. Now, track all of your cases across all Vive carriers in one place. Our case status dashboard displays real-time information and alerts so that you can easily stay on top of everything. The Vive Score. Price isn’t everything. For the first time ever, a number that scores the overall consumer value of the product above and beyond price. We want to hold your hand. With our share-a-quote tool, we’ll even start your order for you and send you a link to the order. 5 new ways Vive saves you valuable time. See how the industry’s first completely paperless process simplifies your experience. 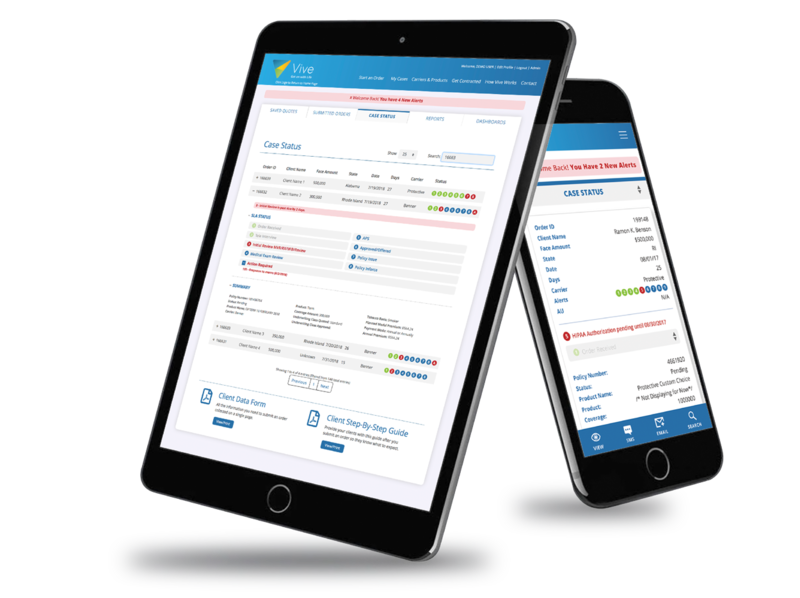 Quote, compare and submit an order in just 5 minutes. 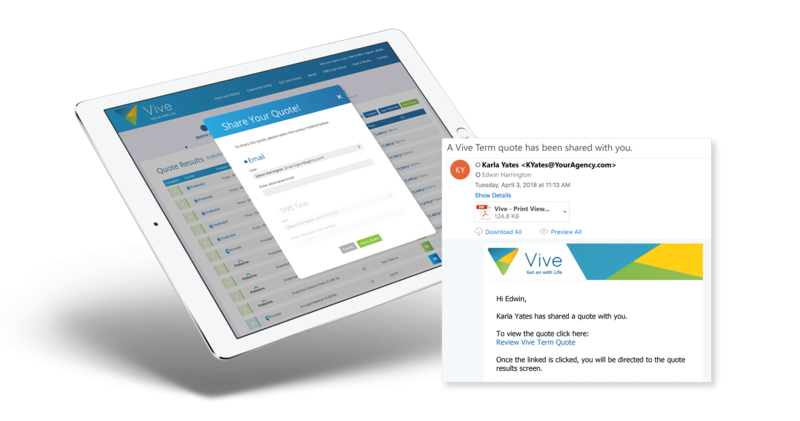 Vive gives you the industry’s fastest way to write term life insurance. Get Accelerated Underwriting decisions in days instead of weeks. Vive’s groundbreaking technology feeds data directly to insurance carriers. These direct links allow Vive to immediately determine your client’s AU eligibility. It’s a breakthrough that allows carriers to make more non-medical underwriting decisions in a matter of days. No exam, no blood, no medical records. The Vive Score. Because price isn’t everything. In an industry first, Vive creates a weighted score to rate the overall consumer value of each product above and beyond price. No other online tool does so much to make consultative selling so easy! Real-time case status at your fingertips. Vive automatically aggregates all case status across all Vive carriers in one location. Auto alerts via email or text let you focus on cases that need special attention. More cases stay on schedule with a lot less effort. We want to hold your hand with quote sharing. Just contact your Vive-affiliated BGA now and ask them to run your quotes for you. They’ll start your order and send a Share-a-Quote link by text or email. 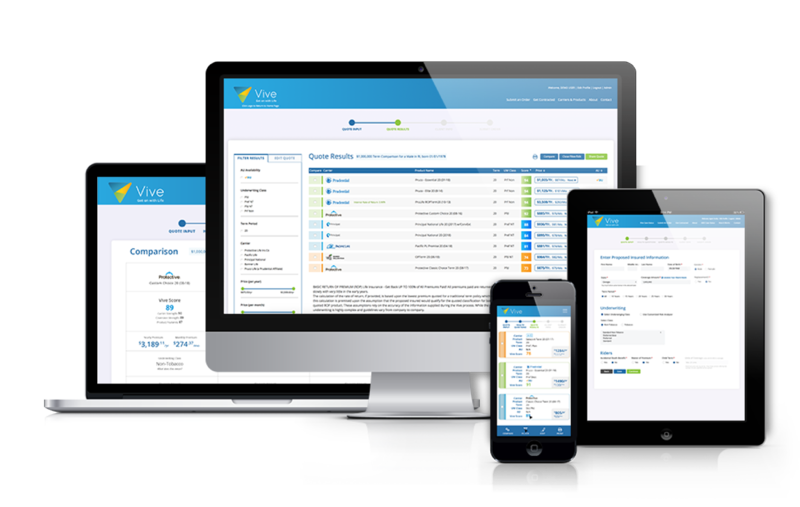 You get instant access to the order for internal review, revision or finalization. Quote, compare, select and submit an order in as little as 5 minutes! Submit an order from your phone, tablet, or computer and it will be transmitted directly to the carrier and your Vive-affiliated BGA. Significant time and effort is reduced thanks to our electronic signature platform. Open safari on your iPhone or iPad, navigate to getvive.com. Click on the share button at the bottom of your screen. A menu will open, click the add to home screen button. Rename the bookmark “Vive”. Then tap the add button. The Vive icon will now be available on your home screen. Open chrome on your phone or tablet, navigate to getvive.com. Click on the menu button, typically located at the top right of your screen.